Hi everyone — Merrick from Merrick’s Art here! 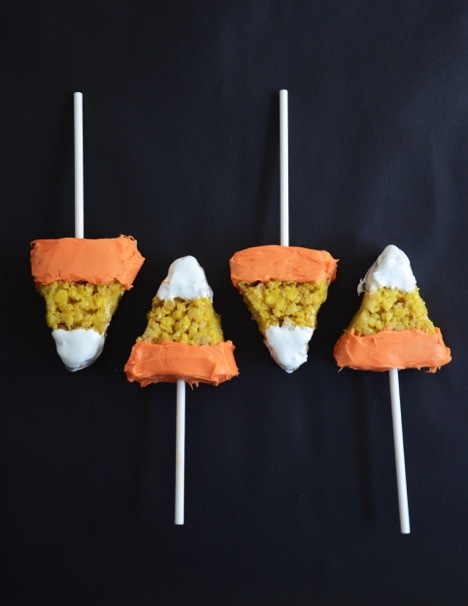 Halloween is quickly approaching, and it’s the perfect time to start whipping up some festive treats you can share with friends, or just munch on at home. 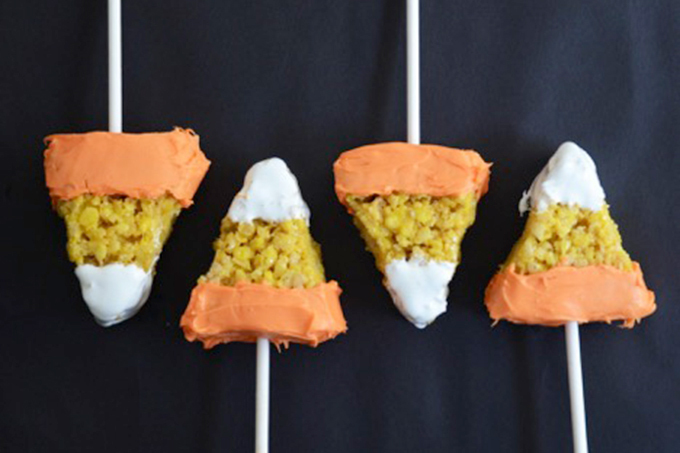 I made these little candy corn crispy rice treats for a work event years and years ago, and thought I’d bring them back with a kid-friendly twist — crispy rice treats on a stick! Step 1. Melt the 3 tablespoons of butter in a saucepan. Add the entire bag of marshmallows and stir until completely melted. Step 2. Add about 10 drops of food coloring, or until your melted marshmallows are nice and yellow. Step 3. Measure 6 cups of crispy rice cereal into a bowl, and then pour the melted marshmallow sauce over, stirring to completely combine and coat the cereal. Step 4. Press into a greased 9×9 baking dish, and let cool for a few hours. Step 1. Once the crispy rice is completely cooled, cut into small triangles (about 2 ½ inches wide and 3 inches tall). Step 2. 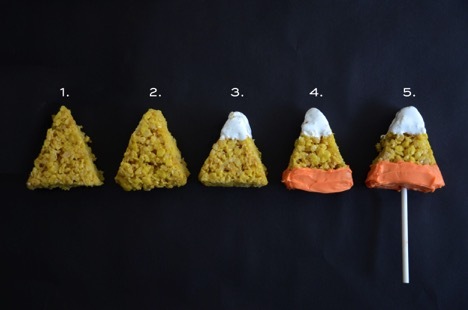 With clean hands, mold the pointed edges into smooth rounded edges to make them candy corn shape. Step 3. Using a knife, spread marshmallow cream on to the top section of the triangle. Step 4. Melt the candy melts, and dip or spread to make the bottom section orange. Let dry completely. Step 5. Push the lollipop sticks up the bottom of each crispy pop and enjoy!